This classic gallery space is located in Midtown West steps away from The Piers and Hudson River. It’s perfect for hosting a Private Sale or Art Opening. Housed in a modern building, the interiors are art-ready, comprised of white walls, cement floors, 12’ ceilings and track lighting. This space offers basic amenities including internet, a kitchen, bathrooms and a freight elevator and can accommodate a variety of art events or showrooms. 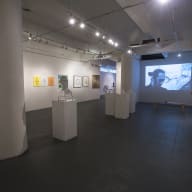 Located blocks away from Lincoln Center, this gallery is easily accessible and a great location for your next art event or showroom.